The State Museum of Pennsylvania, Section of Archaeology, has been excavating at Fort Hunter Park in Dauphin County for the past two weeks. One of our main goals this season is to begin the process of actually archaeologically excavating a water well feature discovered in 2008. Surrounding this feature are prehistoric layers to the south and the west of the well which we have now excavated and recorded. These layers mainly consisted of fire cracked rock hearths dating to the Transitional period. There were also older occupations below these but they are not well dated. The excavation of the surrounding units provides the necessary space to work in the well area without endangering the adjacent cultural occupations. Overview of excavation area, students from Franklin and Marshall lending a hand. On Monday, September 27, weather permitting; we will bisect the well by excavating the western half. The top of the well measures a little over six feet across so we will only be excavating a three-foot wide section. The process will begin by removing the capping stones (only on the western half). Some of these cap stones were emplaced with mortar. Below the capping stones there are a series of pebble layers that extend to at least three feet below the surface. The pebble layer directly below the capping stones seems to represent a buried humus level or “A” horizon. A buried horizon is a term archaeologists apply to land surfaces that can be recognized often by a darker soil color created by the break down of organic plant materials, thus creating a humus level. This evidence of a humus layer leads us to believe that this level may have been the top of the well for some time prior to the placement of the capping stones. Artifacts recovered within this layer will aid in establishing a date for this level. Profile of well feature looking north. The excavation will be conducted in arbitrary levels within cultural levels. All of the material from these excavations will be screened. The top of the well shaft will be excavated in six-inch arbitrary levels, meaning we will measure our excavation levels as we progress and record our findings in these six-inch designations. In 2008, the well shaft was augured to a depth of over eight feet, this test contained early twentieth century artifacts. Typically, when wells are no longer used for water, they are treated like trash dumps until they are filled. If the stratigraphy becomes more complicated with depth, we will need to adjust our strategy. A big unknown is the total depth of the well and we hope this can be determined with additional auguring. Based on the height of the site above Fishing Creek, the well may be thirty feet deep. Excavating to that depth would be a very difficult engineering feat let alone a complicated archaeological excavation. This season, we hope to get down to at least nine feet. For safety purposes, a deeper excavation will require us to step back the excavation or begin shoring. All of these issues will factor into the excavation which could potentially get very complicated and expensive. We are hoping the rewards are worth the effort. 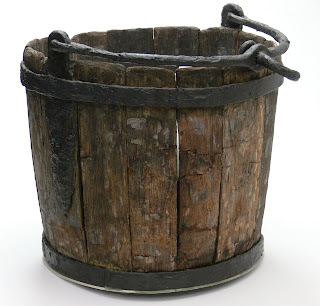 The well at Fort Loudoun in Franklin County contained the bucket but also rare leather goods such as shoes and boots. No matter how this all turns out, by the end of next week, we should have a much better idea of how the well was constructed, its age and the appropriate excavation procedure for next year. We have had a lot of help this fall from volunteers and students at Franklin & Marshall College. Thanks also goes to local channel News 8 for covering our excavations this week and to all of you who visited the site for Fort Hunter Day on September 19th, we enjoy speaking with you and sharing our enthusiasm for this project. Fort Hunter Day crowds gather to observe excavations and ask questions of Dr. Kurt Carr. Excavations continue on the east side of the mansion looking for evidence of the fort with assistance from Franklin and Marshall College students and volunteers. With any luck we should also have an impressive hole in the ground, which is always a sight to see. Come visit us at Fort Hunter and stay tuned for updates on our adventure into the past. This week we’d like to toot our horn a bit if we may over our recent reaccredidation and our public outreach program at Fort Hunter. The State Museum of Pennsylvania has again been accredited by the American Association of Museums, or the AAM. Accreditation is the highest national recognition for a museum, according to AAM. Only 775 of the estimated 17,500 museums operating in the United States – or about four percent – are currently accredited by AAM. This is the third time that The State Museum has earned this professional status, which is established through a rigorous peer review process conducted by AAM every ten to fifteen years. Accreditation is conducted by a team of museum professionals who review the institution and assess collection stewardship practices as they compare to other institutions. It requires a thorough accounting of collection practices, review of institutional goals and objectives, and identifying efforts being made to improve conditions of collections. The AAM report noted, “The State Museum of Pennsylvania is commended for its outstanding commitment to upgrading collections care even in the face of budgetary constraints.” An estimated 4.1 million artifacts and specimens are either exhibited or curated in high density storage equipment. The State Museum first opened to the public in 1905 and moved to its current site at 300 North St., adjacent to the State Capitol Building, in 1965. The museum serves more than 130,000 visitors annually, including 60,000 students from across the state. Exhibit areas total more 100,000 square feet. The large collections on display and in storage encompass paleontology, geology, botany, zoology, archaeology, art and significant industrial, political and domestic collections associated with the state’s history. The archaeology collection is the largest of these sections. The large volume of artifacts in our section is due in part to our responsibility as a State and Federal repository for archaeological collections produced from site investigations utilizing these funding sources. An important role of a repository is providing access to collections for the purpose of scholarly research and insuring the security and preservation of artifacts. We encourage research of collections and have been fortunate to have many students and professionals produce manuscripts and publications based on research conducted at The State Museum. Some recent projects include Circular Villages of the Monongahela Tradition Dr. Bernard K Means, 2007, The Interpretation of Carved Faces Found on Boulders and Cobbles Stanley W. Baker Ohio Archaeologist, V.60,No.2 Spring 2010, and Salt-Glazed Stoneware in Early America Janine E. Skerry & Suzanne Findlen Hood The Colonial Williamsburg Foundation, Williamsburg, Virginia, 2009. Many of you who follow our blog have read about collections that we received over the past few years that have increased our knowledge of Pennsylvania history and prehistory. We continue to strive to improve our public outreach and access to these collections via our blog and our web page. Thanks to the AAM for their resounding support of what we do at The State Museum which is to educate the public and preserve our rich Pennsylvania Heritage. Celebrating our heritage is an important part of Fort Hunter Day which will be held on Sunday, September 19th at Fort Hunter Park. There will be musical presentations as well as craft demonstrations throughout the day. This is also where we will be continuing our excavations in search of the elusive evidence of a French & Indian War period fort. We have removed the backfill from last year’s excavations and are cleaning up a prehistoric floor in our large unit before we tackle our possible well/cistern feature. Here are a few shots from the field this week- hope you can make it out to view our excavations and participate in the great activities at Fort Hunter Day 2010. It’s Almost Archaeology Month so… It's Fort Hunter time! During Archaeology Month 2010, archaeologists from The State Museum of Pennsylvania will return to Fort Hunter for the fifth field season. This week, the backfill from last year was being removed and new excavations will begin early next week. The project is located at Fort Hunter Mansion and Park, five miles north of the capitol in Harrisburg. The goal is to locate the remains of the French and Indian War era supply fort occupied between 1757 and 1763. Fort Hunter was part of a chain of three forts built along the Susquehanna River by the British in the mid-1750s at the outset of the French and Indian War. The largest of these was Fort Augusta, located at the confluence of the North and West braches of the Susquehanna River at Sunbury. This was a massive military installation, with earthen walls over 700 feet long. The second fort was located at Halifax, about 20 miles north of Harrisburg. Based on historic documents, Fort Halifax was square with wooden walls or a stockade that measured 160 feet on a side. Fort Hunter was designed as a supply fort. However, there are no verifiable accounts that anything more than a blockhouse was actually ever built, and the exact location of a stockaded fort has long been debated. There is a reference that the logs for the stockade had been cut, but there are no accounts of the posts ever being erected. The site is currently being interpreted as a 19th-20th- century manor and farm. In 2006, we uncovered what we believed to be a fort related bake oven. 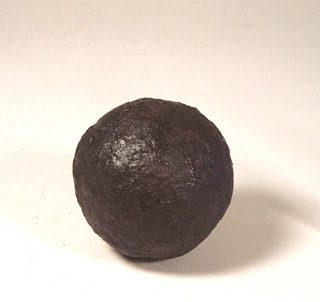 Munitions discovered at the site include musket balls, bird shot and a four pound cannon ball. Numerous gunflints have been found. Of note is a gunflint which still retains a lead patch, a method associated with the military. In addition, numerous other fort period artifacts and features have been recovered - some of these may be part of the fort occupation or they may relate to the earlier Samuel Hunter farmstead or the later Col. McAlister house. The stockade and the blockhouse, however, have yet to be located. The goals for this year include two main objectives. We will continue to search for the fort’s stockade line and/or surrounding ditch by expanding on excavations in the east yard begun last year. At the end of the 2009 season, a section of thickened A horizon was encountered in this area. This feature is approximately 15 feet wide and had an average depth of 15 to 28 inches. The artifacts from this feature were a hodgepodge of ferrous metal objects, a glass wine bottle fragment and a Lamoka projectile point. This feature still holds the possibility of relating to the fort occupation. 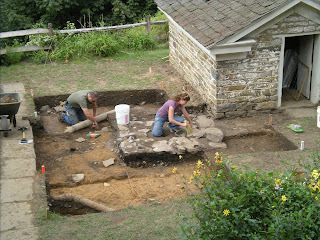 The second area of interest is the block excavation in the north side yard of the mansion. This area contains several interesting features discovered in 2008 and 2009. The largest is a stone “waterwell”. This structure is adjacent to a 1794 icehouse and this year we hope to resolve the chronological relationship between these two structures. This was the goal of last years investigation but the complicating factor has been the stratified prehistoric material all around the “well”. Removing these artifacts required careful documentation of location and position and consumed more time than planned. We still need to remove several levels of soil in this area prior to investigating the “well”. Complicating the interpretation of the “well” was the discovery of an iron pipe entering this structure seven feet below the surface at the very end of the 2009 season. What we thought was a waterwell may be a cistern and dating to the 19th century rather than to the fort period. Historic site archaeology can be very complicated and it is often difficult to interpret ground disturbances but we are hopeful this season’s investigation will resolve the “well” issue. Finally, ten feet north of the well/cistern is a line of rocks that we initially thought was a walkway. However, by the end of the 2009 season, when we had cleared the upper levels, it is now being interpreted as a possible building foundation. This will require an expansion of the block and, again, the excavation of a substantial prehistoric occupation. Come visit us at Fort Hunter Park http://www.forthunter.org/ .Our project is part of Pennsylvania’s “Archaeology Month” celebration in September and October. Excavations are open to the public for viewing, weekdays from 9:00 am until 4:00 pm, weather permitting. 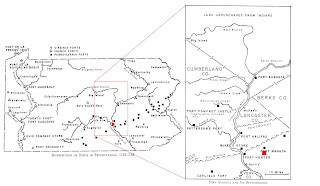 For more information on Fort Hunter or the archaeology of the Susquehanna Valley, visit PAarchaeology.state.pa.us or the Hall of Anthropology and Archaeology at The State Museum of Pennsylvania. This weekend our staff along with a few volunteers will be participating in the 14th annual Native American Pow-Wow at Kipona Fest 2010 . We will be bringing the ever popular recreated dugout canoe, informational brochures on State Museum programs with coupons for reduced admission, children's activity worksheets, the 2010 Archaeology Month poster, and an exhibit of select artifacts from City Island excavations. For example, partnering with the Society for Pennsylvania, Inc, in mid August, we set up an exhibit using our dugout canoe and a demonstration of our geographic information system at Cabela’s in Berks County. We spoke to roughly3500 people that weekend. 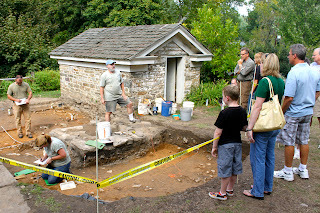 We hope to greet and share our enthusiasm for archaeology with more visitors this weekend at Kipona Fest. Kipona Fest is a huge attraction for South-central Pennsylvania and we are pleased to be able to participate. The purpose of our presence at the pow-wow is to raise awareness of all things archaeological. Archaeology is the only science that can reveal the past prior to writing. Evidence of native peoples discovered through archaeology have yielded important information regarding the lifeways of these groups. Archaeological sites are important non-renewable resources. Once these sites, both historic and prehistoric, are destroyed the link to our heritage which they may yield is lost.